Groundbreaking Roots: Farming the Coldest Spot in the U.S. When I asked Daniel about the biggest challenges he has encountered growing vegetables without chemicals and poison, he started by explaining a little bit about the local climate. Cerro Vista Farm is located in the coldest spot in the United States. More specifically, the Farm gets only 80-85 frost-free days each year. By comparison, Fairbanks, Alaska gets about 95 frost-free days each year. I'm sure that competition for the coldest spot in the United States is fierce, but I'm willing to go with Daniel on this point. When it comes to growing food, frost-free is important. Even with high temperatures and a long growing season, one hard frost in the middle of August can wipe out many vegetables. The valley surrounding Cerro Vista used to be home to many subsistence ranches. Since 1995, there have been four years of very severe drought. Each one substantially thinned cattle herds. Additionally, during the 2005-2006 winter, cattle got caught in huge snow drifts and died. Now there is not one such ranch left. The reality is that the weather here is harsh, and harsh weather makes for challenging farming. How does Cerro Vista Farm cope with this? Daniel chooses early season varieties, starts them in greenhouses, and then transplants. This year Daniel is growing 60,000 transplants. He also makes sure his plants get all the water they need. We all must share the water brought to us by natural hydrological systems. Farmers in particular need a lot of it. Cerro Vista Farm cultivates six acres of vegetables. 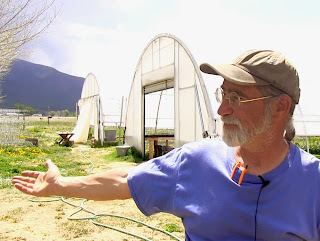 Daniel left the immediate environs of Taos and moved his farm further north and into higher elevation to ensure that his vegetables had all the water they needed. Daniel didn't want to talk about water conservation on the farm. Near Taos, he was at the mercy of acequias, the community-maintained system of irrigation ditches distributing snow runoff to farmers' fields. Acequias are similar to the ditch system operating in Boulder. Even as mayordomo - the man in charge of equitable distribution of water from the acequia - Daniel still didn't have the reliable access to water that his vegetables demanded. In the end, that is why he moved away from his customer base and away from warmer weather. This was a surprising denunciation of acequias. I was fully expecting acequias to be a key to the survival of agricultural communities. But for Daniel, it had been a hardship. At Cerro Vista Farm, Daniel has a well and he can pump from it whenever he wishes. Daniel has seen a general trend of more extreme weather in all seasons. But last year he noticed clear evidence that climate change is here. He has been farming for 35 years. Last year, for the first time in 35 years, the ladybugs didn't show up. Ladybugs keep aphids in check. Last year, Daniel had an aphid problem for the first time ever. The rest of the growers in the larger area found themselves in the same predicament, watching aphids multiplying unexpectedly. Last season about 75% of the hummingbirds did not show up. About 80% of the monarch butterflies did not arrive, even with lots of their favorite milkweed in the vicinity. And, about 90% of the ladybugs did not show. As a result, this year, Daniel will be scouting for aphids regularly. If he finds any, he will attempt control with an organic pesticide. Daniel attributes the alarming decline in insect and bird population at Cerro Vista Farm to climate change. It's also possible that increased use of insecticides are the culprit. A recent press release by the Task Force on Systemic Pesticides explained the findings of their comprehensive analysis. They analyzed all available literature and found that the neonicotinoid class of systemic pesticides poses a serious risk of harm to honeybees and other pollinators such as butterflies and to a wide range of other invertebrates such as earthworms and vertebrates such as birds. According to the Task Force, this poses a wholesale threat to our natural and farmed environments. Regardless of whether climate change or widespread insecticide use is to blame, Daniel and all the farmers in his area will have to deal with the loss of ladybugs. They must also figure out how to farm with the new extreme seasons. When I asked Daniel about his biggest pest problem, he told me about a problem with a big pest. He described the year one of his neighbors decided to raise yaks. Yaks can weigh as much as a ton, so they are indeed big. I could see the mirth in Daniel's face as he described teenage yaks easily jumping a four foot fence. On the other hand, a full adult yak would just walk through the fence. No need to jump. Needless to say, Daniel had trouble keeping them off his farm. When toxic herbicides are not used, weeding becomes an important priority. There is a limited window in which to get the weeding done or risk losing a crop. With six acres to weed mechanically, Daniel does 95% of his weeding on a tractor. Weed management poses a key dilemma for farmers. Farmers who don't use herbicides typically rely on tilling. Tilling reduces organic matter and soil. Daniel balances this out by fertilizing his soil with compost from a nearby organic compost factory. The dilemma is that those who move toward no-till systems, typically use herbicides, which present a threat to health, pollute soil and water, and lead to herbicide-resistant weeds. At Soaring Eagle Farms, they are using cover cropping to reduce tilling, but tilling is still required. At 63rd Street Farm, they are experimenting with pig-tilling to replace tractor tilling. At New Roots Urban Farm, they weed by hand, but they are a very small farm. Farmers are still experimenting with alternative solutions to weed management. From my perspective, Daniel has chosen tractor-tilling over herbicide-use. Of course, from Daniel's perspective, herbicides were never on the table. Daniel brings the skills from his background in accounting to bear on the farm. He tracks metrics for his spending on seeds, keeping his equipment and buildings in good repair, and trips to Taos. Questions about profitability were not simple questions. Daniel was ready to quantify profit from ten different angles. Thankfully, he made an effort to simplify for me and reported that his average profit before depreciation was 10%. His goal is to turn a 25% profit. When I prodded him about a revenue target, he said he'd like to make 1/4 million in sales based on 7 acres of vegetables under cultivation, in his harsh environment, without chemicals and poison. At Cerro Vista Farm, hard work, excellent tracking of expenses and income, and attention to the details of seed varieties, greenhouse use, irrigation, weeding, and composting have led to a profitable venture. Daniel has 7-8 (full-time equivalent) employees. He has 5 full-time apprentices. And there are 28 neighbors doing a weekly work-exchange. They commit to 4-hour shifts at least one day a week, and at the end of a shift they take home the freshest possible produce. Daniel finds that farming with others makes it more fun. And I would wager that farming with Daniel makes it more fun, with all his fabulous one-liners. Last year, Daniel counted the number of friends and acquaintances with whom he came into contact each week - people who he knew well enough to know their first name. 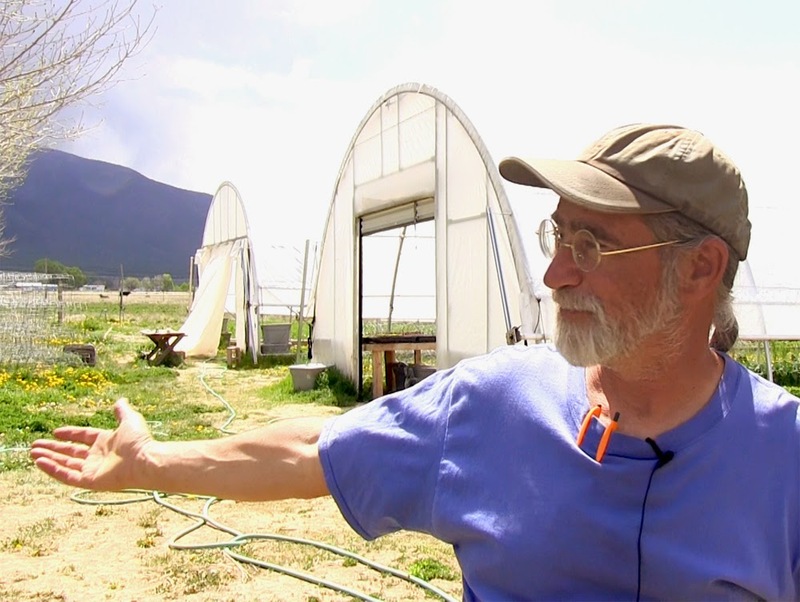 Between those working on the Farm, customers of their CSA (Community supported Agriculture), folks at the Taos Farmers Market, and the restaurants who buy from Cerro Vista, the average was 600 people per week. Daniel is growing a community-oriented food system. And to quote Daniel, "That means I'll never be lonely again."